In Old Virginia, Whisky Was Infra Dig. John Fiske was a New England-born writer and historian, working in the latter 1800s. He authored many books including a multi-part history of Old Virginia and adjoining regions, Old Virginia and Her Neighbours. While, today, his reputation is (as we gather) as a non-professional historian whose writing is coloured by enthusiasm for social Darwinism, his work is full of tenor and moment. It has real insights for the social historian, in my opinion. 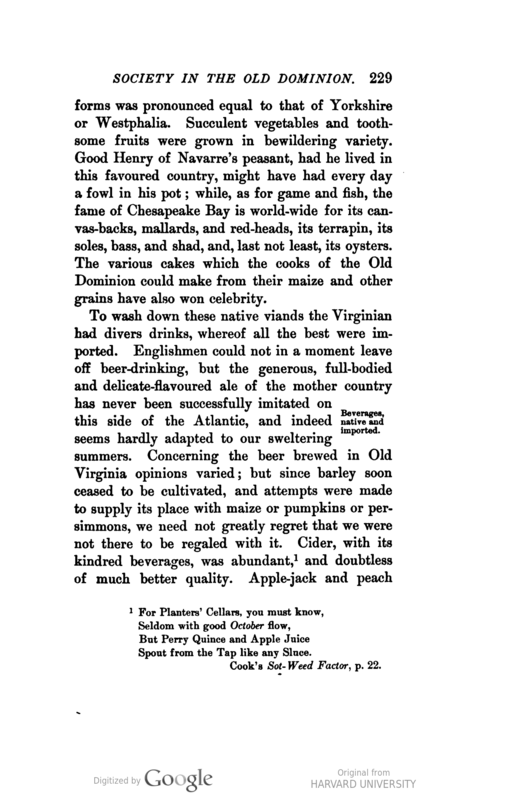 His comments on the drinks favoured by the planter class in the Old Dominion, so basically from founding of the Virginia colony to approaching the Revolution, are instructive. A wide range of drinks was consumed – beer foremost with cider and many imported wines – and spirits too. For the latter, rum and brandy figured mainly. Cider and other fruits were distilled sometimes to make applejack. What was whiskey’s role? Almost nothing. Fiske seemed not to like the cereal liquor, and perhaps this affected his judgments, but still, he states clearly that whiskey, indigenous or imported, had no writ in the Old Dominion. This is not surprising, as until the 1800s, whisky, as I’ve discussed earlier, was simply not an English drink. It had adherents in Scotland and Ireland, from crofter to laird, but was strictly a regional preference in Britain until quite late. And so, if English-origin Virginians did not seek to make or drink whiskey, who did in America? It had to be the Scots-Irish and the Rhineland Germans, as countless writers have stated, to my mind with good reason. And when did they arrive? Not until the last three quarters of the 1700s. Virginia, famously settled at Jamestown in 1607 and propelled initially by the Virginia Company, had existed for over 100 years before the Scots-Irish and German incomers started to make a cultural impact in America. Now, true it is that in the early 1600s whisky was relatively novel even in Scotland and Ireland, at least in society. It was still emerging from the misty vales and Highland hills as a semi-licit invigorator. But still, the best French, Spanish, and German wines and brandies were imported for the First Families and other English emigres on the Tidewater and inland. Had whisky any market or cachet in southern England whence most Virginians and many Marylanders came, it would have been available too. It wasn’t. Did they drink juleps scented with mint, those second sons and retinues? Very likely, but with brandy, as the oldest recipes for spirituous juleps attest. Read John Fiske on old Virginia. He cites another historian, Philip A. Bruce, who had more to say – a lot more – on the bibulous preferences of old Virginia. More to come soon, from that quarter. 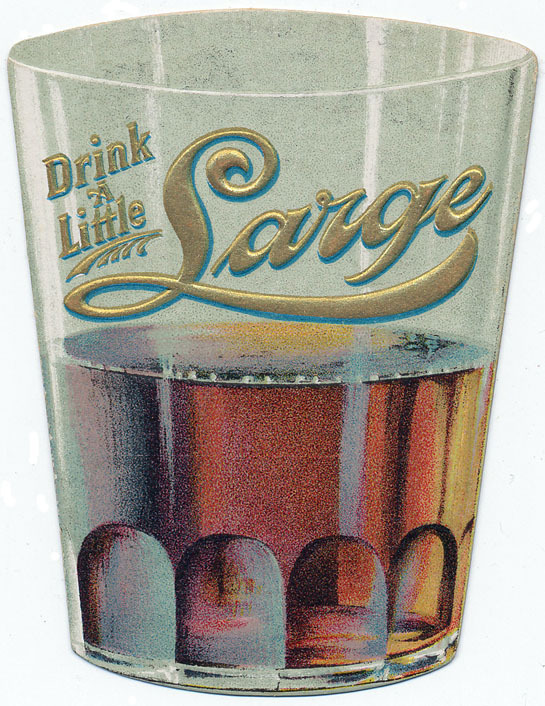 Is there a hint of Puritan disapproval in Fiske’s phrase, “a minute account of the beverages… [our emphasis]”? A safe bet we think – a metaphor Fiske would not have liked either. As early as the 1850s, a wines and liquors catalogue in New York, Cozzen’s Wine Press, lauded Monongahela whiskey as “famous”. It listed Bourbon whiskey too, offering both these in festive hampers with the finest wines of Europe and old Scotch and Irish whiskeys. The market for Cozzen’s wares was the carriage trade and arts circles, and the flower of Pennsylvania and Kentucky whiskey had their favour. Strange it is in many ways, as these whiskies had only come to maturity as it were in the last 30 years. 1821 marks the first time bourbon is mentioned in print, in an ad in Maysville, KY by a local merchant. In 30 years both these whiskeys had become bywords for quality in liquor, and soon the reputation reached around the world. It’s hard to think of an exact analogy, but Ontario ice wine furnishes an example of a sort. It grew from a standing start 30 years ago to a secure place in the pantheon of sweet wines. India Pale Ale, over approximately the same period as bourbon and Monongahela rye, also came to major prominence. IPA as understood today, meaning with the American hop smack, hardly has more than a generation behind it. The high water mark of rye whiskey appreciation was the eve of World War I. Whiskey, need it be said, had a Janus-face. One side was the smooth, equable visage of the gastronome. He spoke in dulcet tones – for refined taste, quality, tradition. The other side was contorted, angry, shouting for a shut-down of the liquor trade. We know which side prevailed. The long years of the Volstead era permanently altered the quality image of whiskey. Rye came back, bourbon and gin and the rest, too. But they were never regarded with the same epicurean delight as before the Kaiser’s war. The Depression and a new system of liquor regulation put paid to that. Anyone bruiting the merits of whiskey did so almost furtively, apologetically. There was the odd exception, Bernard De Voto’s celebration of bourbon, circa 1950, is well-known. Finally, a change occurred, with hundreds of writers since the 1980s elucidating the many gradations of palate in good whiskey. All to the good, but somehow it seems, at least to me, that whiskey’s golden age has been irretrievably lost. Partly this was due to loss of artisan methods and the disappearance of most regional styles of whiskey. Even in Kentucky it was said the various counties had different flavours of whiskey. Something in the air may have particularized the yeast used in some counties. Or, a particular way of working or style of equipment made the whiskey of a district different from all others’. Maybe something new will replace what was lost. The craft distilling industry together with the revived big distillers may in time produce something to rival the choice and quality that used to exist. (I don’t exclude Canada here except that the industry consolidated much earlier than in the U.S. with a resultant narrowing of whisky styles). 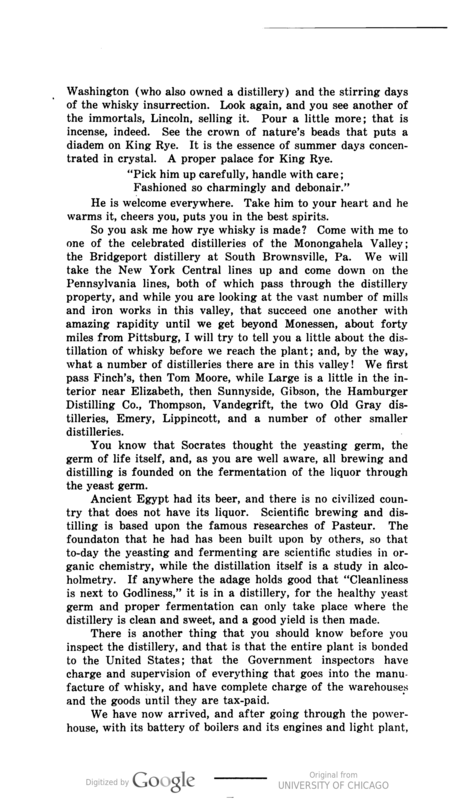 So, to evoke the high point of whiskey appreciation in America, read the words below from 1914. They are from a valentine to the industry published by George Washburne, a Kentucky trade publisher I’ve discussed a number of times. The Hamburger Distillery was in South Brownsville, PA, a famous whiskey town watered by the Monongahela River. Whiskey historian Jack Sullivan has profiled its owner at the turn of the 19th century, Philip Hamburger. He had taken over the place from the founder, surnamed Jones. As Sullivan notes, Hamburger contributed to the national perception that Monongahela whiskey was a choice product. Nonetheless that aura had existed long before, certainly for the high end of the category. In my view too, what “made” Monongahela rye was its aging, initially noticed (we can infer) from shipping the whiskey from afar. A similar quality was finally achieved methodically by warehouse aging at the distillery itself. It’s interesting that the Hamburger distillery and no doubt many others in the “Mon” valley used artificial heating in the warehouse, seeking to accelerate aging and maturity. This aspect clearly lifted Pennsylvania rye to another level. Perhaps it was the key to emulating the whiskey when shipped by barge and ship to distant markets. If Mon whiskey had remained the country white rye made in countless sections of Pennsylvania and elsewhere, it would never have achieved world renown. Anyway, enjoy the modulated tones of A.M. Hanauer below. His style, typical of the period, combines literary flair with American down home. It is the precise obverse of the declaiming Carrie Nation with her axe. Note re images: the images above are sourced, via HathiTrust, from the volumes linked in the text. All intellectual property therein or thereto belongs solely to the lawful owner, as applicable. Images are used for educational and historical purposes. All feedback welcomed. … a few copper stills in the county added the small amount of their production to the large quantities of the Old Monongahela rye whiskey, conveyed by boat from Brownsville and Pittsburgh to New Orleans, and thence sent all over the world. This pure old Monongahela copper pot distilled rye whiskey was of world wide renown, and often graced the board of prince and potentate of the Old World. It took its name from being principally distilled in the Monongahela Valley. Recently I’ve been focusing on the whiskey tradition of Eastern and Central Pennsylvania, one often associated with German Palatine immigrants. This whiskey preceded rye distilling over the mountains in the southwest section, from Bedford to Greene counties as well as Fayette, Washington, and Westmoreland counties. It was the latter distilling, especially along the Monongahela river, that became known as Monongahela rye whiskey and acquired fame throughout the U.S. and beyond. In fact, Monongahela whiskey’s repute began before the Civil War, certainly by the 1850s it was known nationally and even earlier in specific markets. 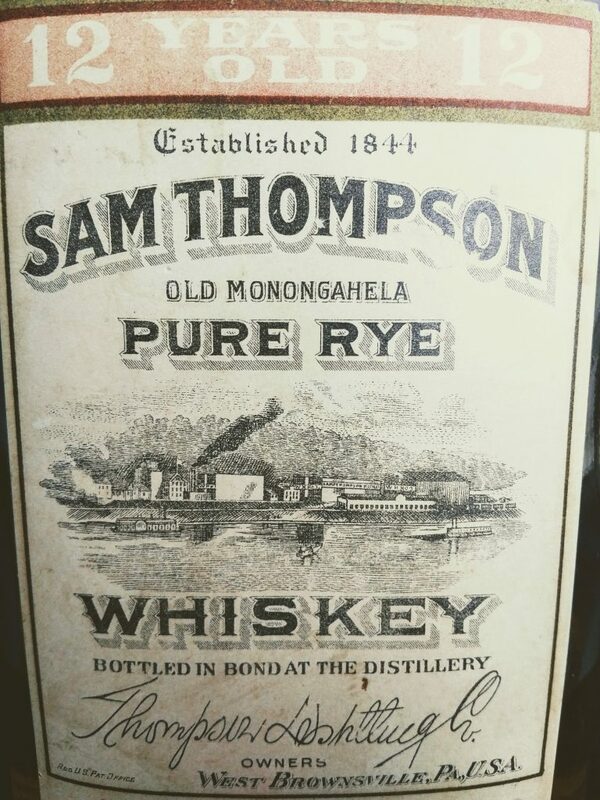 Since rye whiskey was made all over the granary of Pennsylvania, why did the Monongahela version became so well-known? It was famed in its own right and as the predecessor to Kentucky bourbon. Names connected to this tradition included Dillinger, Bridgeport, Overholt, Gibson, Sam Thompson, and Large, but there were many others. West Brownsville, right on the river, was a locus of production in the later 1800s, home of old Sam Thompson. The Monongahela river rises in north-central West Virginia and flows northward to end in Pittsburgh where it joins the Allegheny River to form the mighty Ohio. It’s a traverse of 130 miles, often through rich rye-raising country and edging the green Laurel Highlands of southwest Pennsylvania. Rye whiskey was shipped by that route to Pittsburgh. From there it was sent downriver on Ohio flatboats to New Orleans, whence to world marts. The transport in wood barrels improved the whiskey due to changes of climate, the time of transit, and rocking on the water. Water transport was an early means to improve liquors. What started with utility ended as both that and a technique to improve quality. From Scotch whisky to Madeira – and India Pale Ale – examples can be cited of liquors made famous in part through being sent far afield. It is obvious, or I think it is, that this transportation factor was the key to success for Monongahela whisky, a whiskey whose flavour equalled the euphony of its name. The navigable Monongahela waters made it convenient to send whiskey upriver for transhipment to distant American cities and the world. You can see the pattern by continual references in the literature to Pennsylvania “country whiskey” or similar terms, e.g., mountain dew, common whiskey, moonshine. The latter were new whiskey, white or nearly so whereas long-shipped rye whiskey was red-to-brown and sweetish from the effects of the barrel. The two were almost different products. The same thing happened to bourbon: country corn moonshine became a lush, brandy-like spirit thousands of miles away by virtue of long shipment on the water. 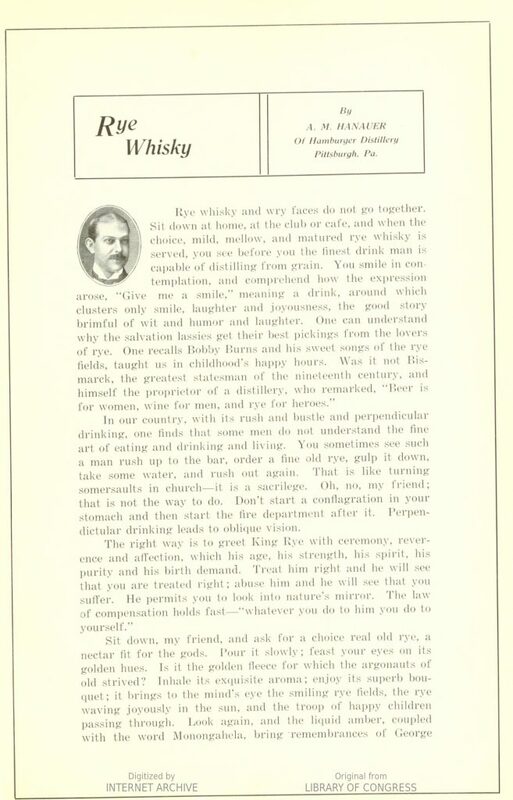 Both Pennsylvania rye and bourbon ended by being successfully aged at the distillery: a similar quality was achieved to the shipped article. An analogy is ale long-stocked in England as compared to pale ale sent to India. Porter long-vatted in Dublin as against foreign stout shipped in wood to … everywhere. The extremes of temperature in Kentucky resulted in a very flavourful product, all that whiskey moving for years in and out of the barrel frame with the cycles of cold and hot. Despite differences in climate the warehouses of the Monongahela rye distillers achieved a high quality as well. I had the chance to taste original Michter’s Original Sour Mash whiskey many times, a rye-heavy whiskey which was a classic Penn State type despite being made in an eastern county. You could taste subtly the forest in it, it had a cool, autumnal quality vs. the gothic richness of Kentucky whiskey deriving from the crazy extremes of heat. Finally, the Pennsylvania industry died out; Kentucky’s endured. Rye is made in Kentucky today of course, and now in many places, including Pennsylvania again by revivalists, so perhaps a great Pennsylvania distilling tradition, based on rye, will rise anew. 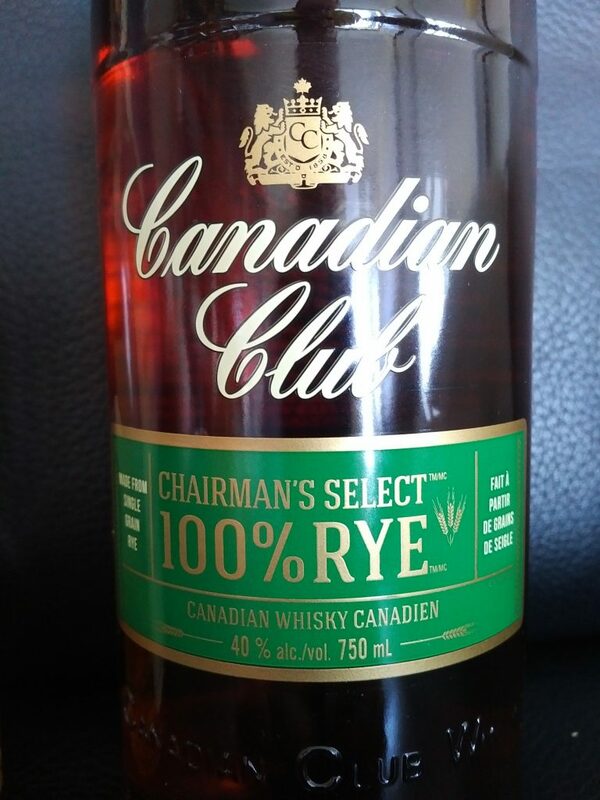 A Canadian rye whisky, Canadian Club Chairman’s Select 100% rye, offers plenty of flavour and quality. In past years it was used to flavour the blends of Alberta Distillers but some is bottled on its own now under the Canadian Club label. Some other bottlers feature whisky from this source too, at different ages and proofs. WhistlePig rye is an example, featuring bottlings recently that are partly aged in Vermont. Selection is important here, I’ve never found WhistlePig to have the richness of the CC version, but perhaps the bottler wants it that way. I’d think the CC Chairman’s Select is similar to the best old Monongahela whiskey even though made far away. Stylistically it follows the old Mon style: distilled at low proof, made mostly from rye, and aged for long years in new charred oak. It would be nice though to have it at 50% abv proof, the old bonded U.S. strength. Or if that’s an unwarranted U.S. intrusion, how about 57.1% abv, the old Imperial proof standard? I’m there. Note re image: the second image above was sourced from the Large Distillery page here at www.pre-pro.com, a site devoted to chronicling the distilleries, brands, and memorabilia of pre-Prohibition distilling. All intellectual property therein belongs solely to its lawful owner or authorized users, as applicable. Image used for educational and historical purposes. All feedback welcomed. Distant Ancestor of Rye Whiskey? I’ve been meaning for some years to get a bottle of German korn. In fact, when researching recently various questions relating to the origin of rye whiskey, I found a 2004 post of mine on the forum of www.straightbourbon.com, America’s premier online bourbon forum, indicating an interest to taste this. Well, 13 years later, I finally did. It is sold at LCBO for about the price of a standard vodka while being 32% abv, under vodka proper by eight points. This doesn’t bother me and I’d guess the reason is because the drink typically is drunk neat, often with a beer alongside. I imagine the producer considers it tastes better at the lower proof and indeed the mouthfeel is soft and silky. If consumed usually with beer – so more alcohol – probably it is felt it should be sold weaker than a standard vodka. I don’t think maximizing company margins is a factor, in other words. 32% is still plenty strong anyway. The taste is excellent but it’s vodka-like, it tastes like a high quality vodka. I was hoping for some of the character a distillation at lower than a presumed 94-95% abv would produce. There is I think a faint grain note, it reminds me somewhat of Global Alcool I bought in Quebec last year that I’ve mentioned a few times here. That one had a slight “gamy” note, I think I called it, which I liked as it showed the quasi-whisky character. This Berentzen though is closer to standard vodka than the Global. 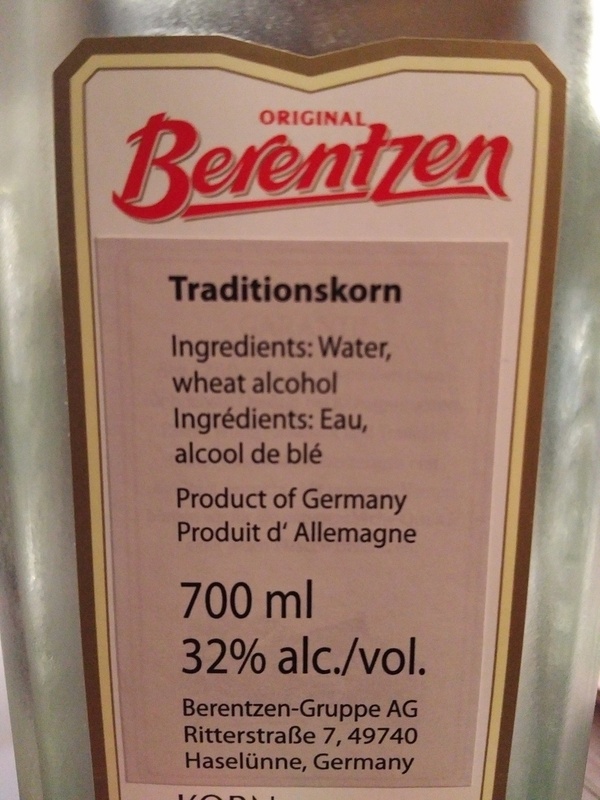 I note from the company’s website that it offers the well-known Doornkaat schnapps, at 38% abv which it indicates is triple-distilled, while Berentzen korn is double-distilled. The extra distillation to the former might impart a touch more neutrality, but it’s faint, as I’ve had the other drink over the years. The main difference is surely the abv difference and both are wheat-based. 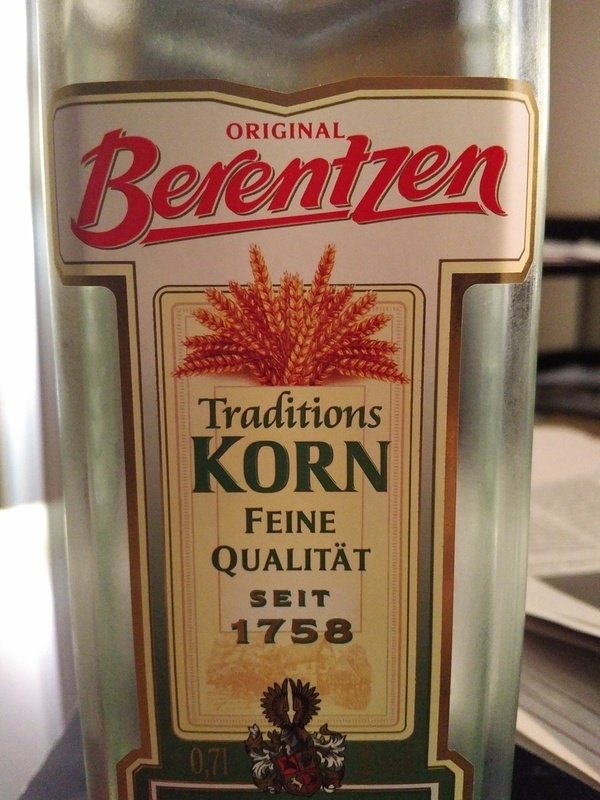 Perhaps some German korn does offer a whiskey-like taste, general online comment suggests this is so. But in any case the Berentzen is quite distant from your typical “white whiskey” sold by numerous distillers in North America. It’s very good though, I’m not sorry I bought it. Occasionally I like an ounce of vodka straight, the different brands do taste different despite the neutrality mandated by law. And it will be useful for Bloody Marys and Martinis. I always wonder how close to neutrality early 1800s distillers got. Their trade ads and other evidence, for example, Samuel M’Harry’s distilling text, do claim a tasteless character in some spirit produced. Sometimes they call it alcohol, sometimes pure spirit. 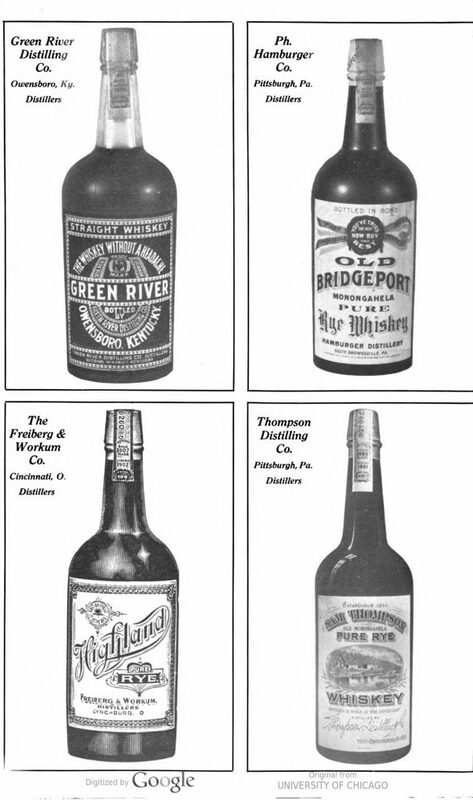 These are distinguished often in ads and other sources from various sorts of whiskey: rectified, common, old, etc. I have a feeling it was in fact possible to attain a high degree of neutrality, not that it would have been very economic before perfection of the column still. The need for repeated distillations or charcoal filtrations using more fuel and manpower, etc. would have dissuaded distillers although it appears some offered it, perhaps at a premium to their regular product. All this to say, I feel the current taste of this drink may not resemble the typical korn of the period when the Palatinate emigrants came to Pennsylvania and adjoining areas. That white spirit was probably closer to white whiskey or white rye, at least those I’ve tasted, than the korn from Berentzen. 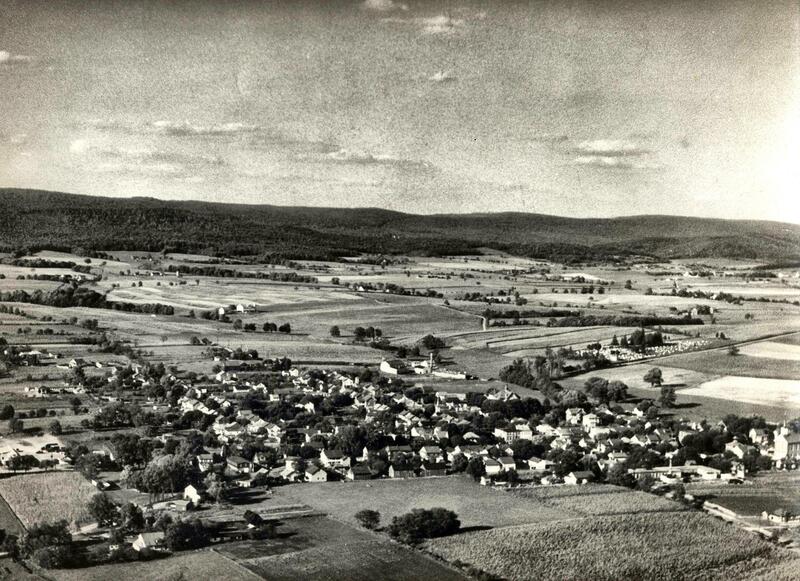 Following on my last three posts, here are some further references to give a sense of early pioneer days in central and eastern Pennsylvania and the strong Palatine German influence. 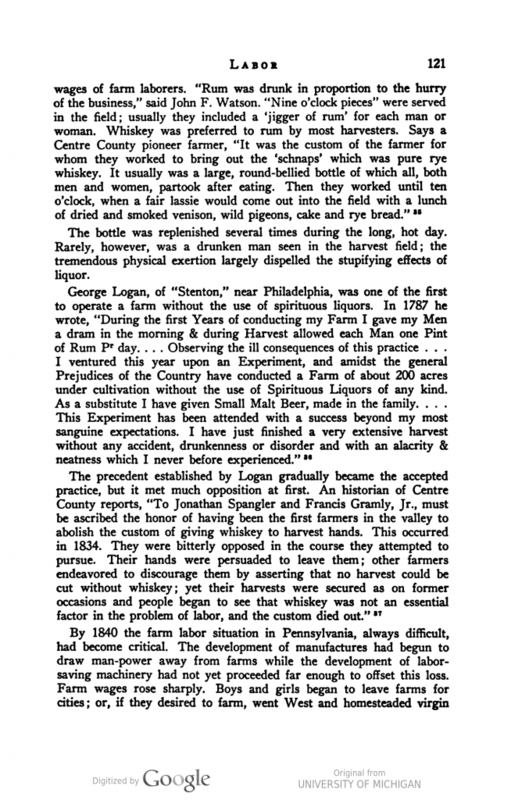 The extract below is from Pennsylvania Agriculture and Country Life, 1640-1840 by S. W. Fletcher (1950). Rye whiskey is called by a German word, “schnaps”. This reflects a regional usage even in English of a term from overseas brought evidently by Mennonite and other German settlers. While the German communities were satisfied often to use the English word whiskey, sometimes it worked the other way around. At a minimum this suggests the familiarity of the German communities with rye spirit and perhaps their origination of it in America. Schnapps is a general term still used in Germany to mean a body of distilled spirits of which the korn group are derived from grain: wheat, rye, etc. I should add as well that korn is said to have a less than neutral taste, which would liken it to North American white whiskey. I plan to test this soon with the single (unflavoured) variety available at LCBO. See also pp 151 et seq in Fletcher’s book for the importance of rye as a crop in early “America” and its primary use in distilling. The exact same thing applied in Ontario, just north of Pennsylvania over Lake Erie, by my reading. 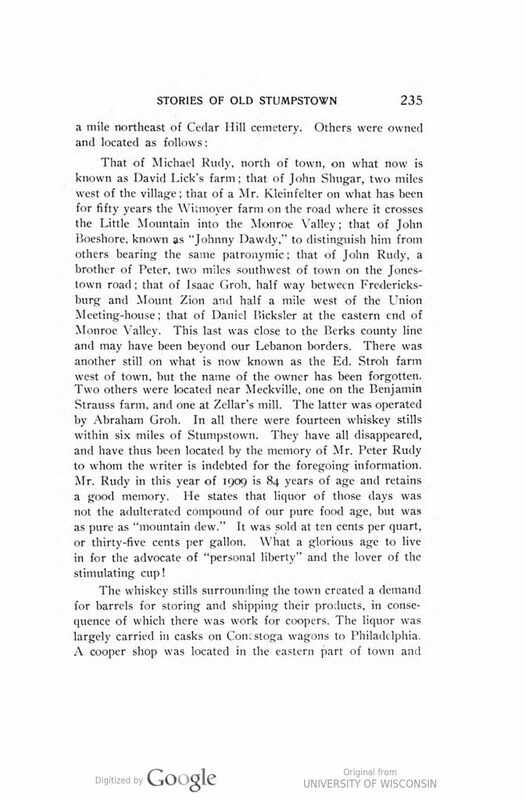 Next, these pages from Papers and Addresses of the Lebanon County Historical Society, v.5, 1909-1911, illustrate the high number of distillers of German extraction in early Stumptown, later Fredicksburg, PA, in Lebanon County. Note again the German terminology. Vorlauf means, not pure alcohol as the text might imply, but the foreshots of distillation. I’d guess the vorlauf was higher in price due to a higher alcohol content than double-distilled high wines reduced to drinking proof for sale. The foreshots was high in alcohol due to being the first run off the low wines at relatively low temperature. It also contained potentially dangerous methanol, especially in a fruit wine distillation. Presumably the distillers knew how to render a safe product as repeated casualties in their small communities would have been noticed. Distillations from grain tend to produce lower methanol levels than from apples or other fruit, so perhaps the foreshots here was from rye or other grain distilling. 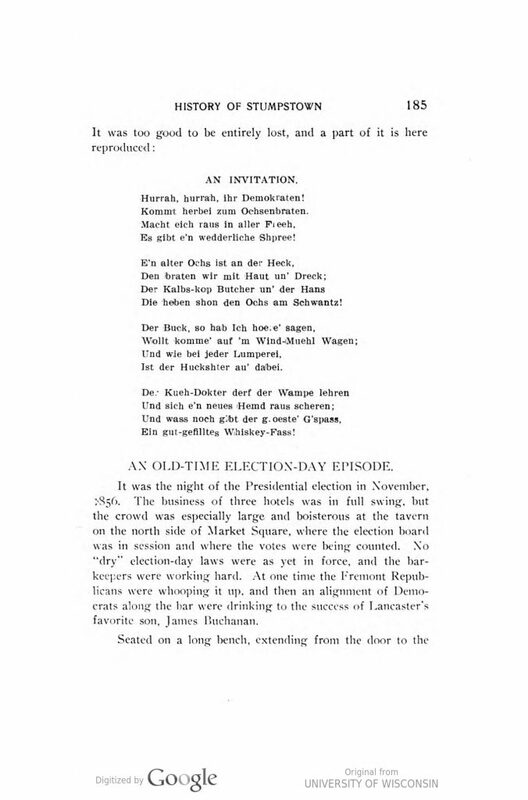 Finally, from the same Lebanon County Historical Society volume, here is a bit of doggerel verse in Pennsylvania German dialect with its presumed, um, wry reference to the “whiskey fass” (whiskey keg). It’s an example of the frequent use in that tongue of the English term, whiskey. I offer a pint of craft ale midtown in Toronto to anyone who will translate it accurately. And no recourse to Google translate by non-German speakers, I can do that! Note re images: the first image above, of Fredericksburg, PA, was sourced from the Library System of Lebanon County, here. The others shown are from the volumes cited and linked in the text. All intellectual property therein belongs solely to the lawful owners or authorized users, as applicable. Images are used for educational and historical purposes. All feedback welcomed. The term Dutch here means Pennsylvania German, a term generally used to denote the peoples of the Rhine Palatinate and northern Switzerland who emigrated to William Penn’s Pennsylvania from about 1717. They were fleeing religious persecution and the instability of war and famine. Our title is taken from a 1963 article of that name, see pp 39 et seq, by Richard H. Shaner, a specialist on Pennsylvania folklore. It was published in a quarterly magazine, “Pennsylvania Folklore”. He described the distilling tradition of this large ethnic group in Pennsylvania. Initially they settled mostly in the central part of Pennsylvania, as the best land in the southeastern corner was already peopled by settlers of English and Welsh ancestry, the first to come under Penn’s tutelage. The southwest of the state, taking in counties such as Westmoreland, Somerset, Greene, Fayette, Washington, is associated traditionally with the Scots-Irish although that is a generalization. The historical reality was more complex, as explained in Leland Baldwin’s 1939 book Whiskey Rebels. His opening chapters explain that the Monongahela region was settled by a mix of Scots-Irish, English, and Welsh with some admixture of German, Dutch, and Swedish. 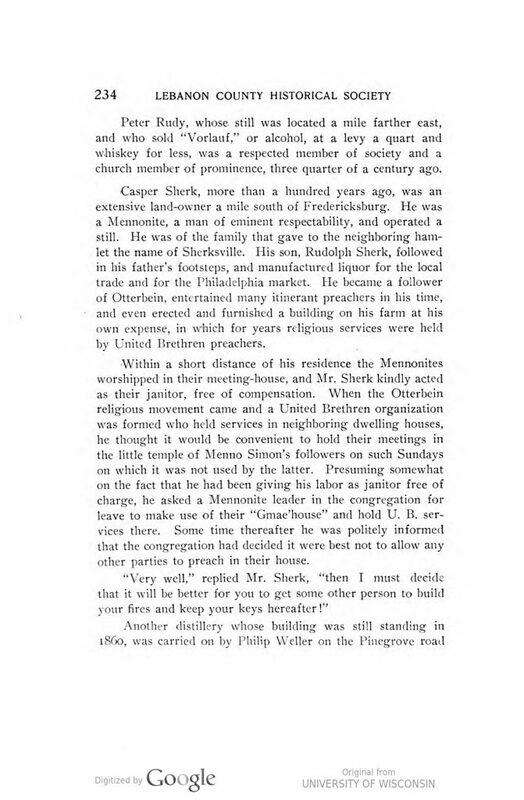 Shaner’s account is not an academic one but local history in the best sense as he lived in Kutztown in Berks County, a centre for this community, and relied on local records and memories of descendants for his information. The account gains authenticity from this and in any case offers a fine picture of a once-vital tradition, distilling in the original, largely self-sustaining rural communities. The economic arrangements described were not unique to the “Dutch” of course, they had their counterpart elsewhere in the state and in Upper Canada, but what is distinct about Shaner’s account is the focus on the discrete “Dutch” community. While he does not state in so many words that these settlers brought distilling skills from Europe, the inference is irresistible, so seemingly hermetic is the world he describes. See also the other articles in the link given, which round the picture. All the families mentioned are of “Dutch” origin and spoke and lived in German for generations. Indeed the language still continues in Pennsylvanian Mennonite and Amish country – and for that matter in Ontario whence some of those people emigrated after the Revolution. In this account of distilling of rye and fruits for whiskey and fruit spirits, the people profiled seem mostly uninfluenced by other cultural practices. It seems unlikely to me they could have learned distilling from the Scots-Irish or Scots settlers. First, there weren’t that many in eastern Pennsylvania especially when the “Dutch” country was first settled. Those British immigrants are more associated with towns in the Cumberland Valley such as Carlisle and McConnellsburg and the counties I mentioned further southwest. Added to this, we know that korn, often made from rye or with this grain forming part of the mash, is an old German spirit. Today it is associated more with northern Germany, and fruit spirits with the south, but the modern commercial industry doesn’t necessarily resemble farming practices of the early 18th century. There were large numbers of German distillers in the early days of settlement in central and eastern Pennsylvania, taking in famously Michter’s/Bomberger founded by the Shenk family in the 1750s. They are documented in histories of the counties in question, and other sources, many of which I have reviewed. I think these Palatinate and Swiss settlers must have brought rye distilling with them. The Ulster Scots and plain (unqualified) Scots unquestionably brought a strong distilling tradition to the areas they settled. But their use of rye may well derive from this other, “Dutch” distilling tradition. I am trying to emphasize that when people speak of the Monongahela whiskey tradition that sparked the bourbon heritage, that is only part of the story. Distilling in the east of the state preceded it. Distillation from cereals – the sources often are unclear – seems to have been engaged in fitfully from the mid-1600s, by the Dutch in Manhattan, perhaps also by some English settlers, but as a folkway and later a commercial industry the Palatinate and Ulster Scots/Scots influences are the main factors. This has to be true, as if whiskey distilling had been significant before these communities made their mark, whiskey, not rum, would have been the prime Colonial drink. Perhaps the Scots-Irish would have distilled with any available grain, but the fact that rye was and to this day is distilled for spirit in Germany suggests to me the traditions merged in regard to a prime grain used in America for whiskey. The luminous serving tray above is from the I.B. Stein distillery of Kutzdown, PA, mentioned in Shaner’s account. It subsisted almost 100 years, expiring with Prohibition and never to return. The whiskey in the ad clearly was red and indeed Shaner confirms it was aged, between three and eight years. This would have represented the whiskey as it was before WW I, but almost 200 years earlier it was probably more typically a white spirit, as most German korn is today. 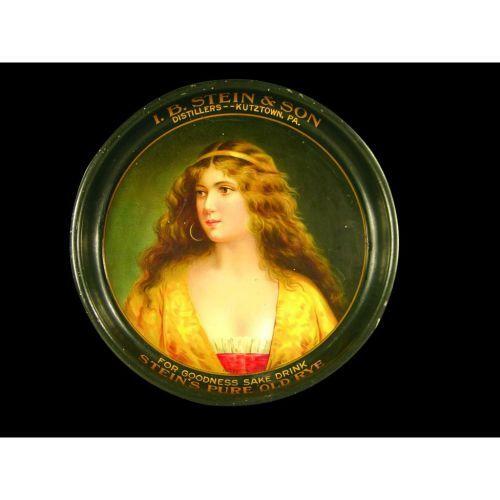 Note re image: The image above was sourced from this collectibles auction website. All intellectual property therein or thereto belongs solely to its lawful owner or authorized users, as applicable. Image is used for educational and historical purposes. All feedback welcomed. 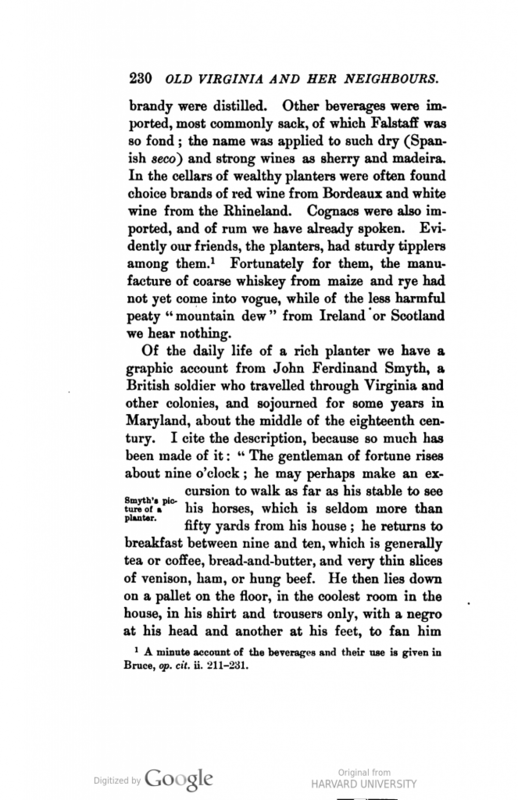 There is one other reference to distilling in Bedford County, PA in Ben F. Van Horn’s book, Bible, Axe, and Plow (1985) mentioned in Part I of these posts. The part which follows deals with the S.S. Brumbaugh distillery. It appears in section 3 of the sixth chapter dealing with local industries. The largest and most famous of the distilleries in Bedford and Blair Counties was the Brumbaugh Distillery which stood at the foot of the mountain on the road to St. Clairsville from New Enterprise. Built around 1860 by Aaron W. Reed, and purchased some twenty years later by Simon S. Brumbaugh, it continued in “production” by his son, Oscar, until 1920. In that year such operations were closed by the federal government in compliance with the provisions of the Eighteenth Amendment (enacted in 1919). 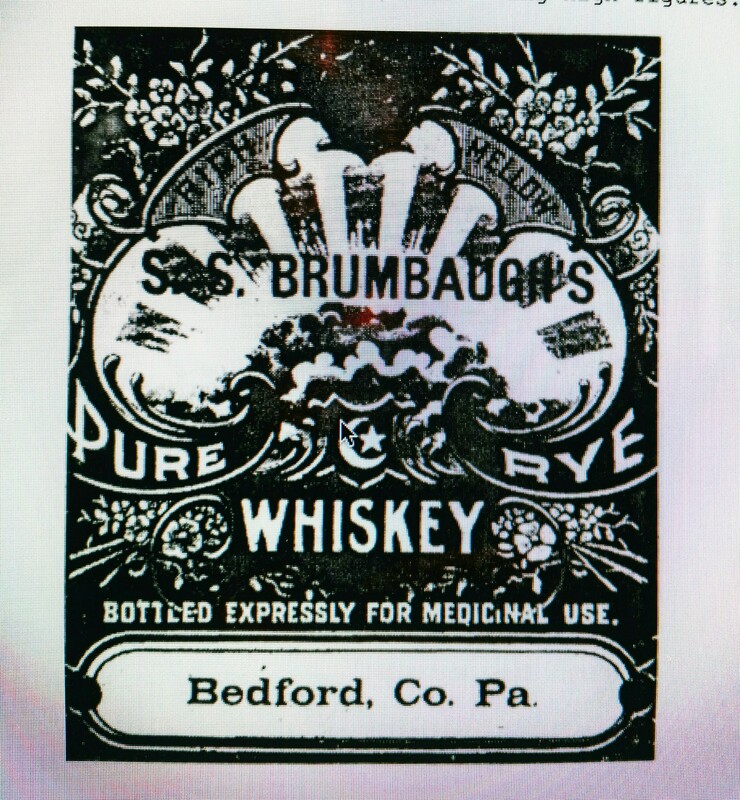 The Brumbaugh Distillery’s stock was shipped under government orders to a Philadelphia warehouse. The distillery was padlocked and stood idle until razed in 1961. 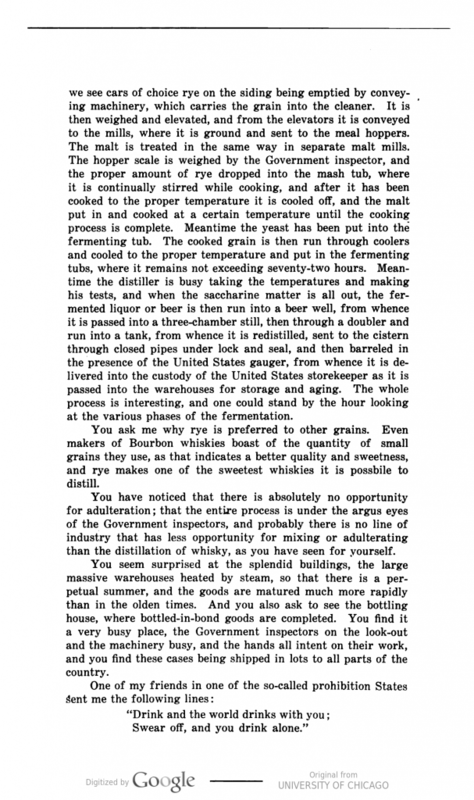 Brumbaugh’s “Pure Rye Whiskey” had the reputation of being of a special quality. It is claimed that its “after effects” on those who imbibed for pleasure were not as painful as that of other distillers. While this might be more legendary than factual, Mr. Brumbaugh’s product was in demand over a wide market throughout central Pennsylvania. For some reason not much rye was raised by the farmers of southern Morrisons Cove and he had to have grain shipped in from western states. The Morrisons Cove Herald’s special edition of July 1, 1971, issued in observance of the Bedford County Bicentennial, included a feature story on the Brumbaugh Distillery. With permission of the publisher, an abstract of the article will be found as Appendix C.
Note re extract: The quotation above is from Ben F. Van Horn’s book, Bible, Axe, and Plow, linked in Part I of these posts. All intellectual property therein or thereto belongs solely to its lawful owner or authorized users, as applicable. Extract is used for educational and historical purposes. All feedback welcomed. I have, over the summer, written numerous posts which establish (IMO) that the taste for whiskey and basic template of its manufacture was introduced to Ontario by United Empire Loyalists and later American arrivals. But what was that American whiskey like, its characteristics? If we can know, that will help us understand what Canadian whisky was like in the 1800s. Of course, whiskey in that period had to vary among producers. It depended on the grains used, the type of still, any aging given, and other factors (yeast, whether flavouring was used, water, etc.). There was probably every type of cereal whisky, from raw white dog to grain mash whiskey aged in new charred oak to pure spirit. In Pennsylvania, Monongahela rye ended as the latter type (straight, aged in virgin charred wood, the rye version of bourbon). Ontario must have offered such whiskey occasionally especially until the 1860s. See this 1857 listing for a distiller in St. Catherines, ON, Francis Stinson, selling “monongahela”, which was probably this type. Stinson is not listed as an importer or dealer and clearly offered the straight style among his range. Perhaps due to consolidation of Ontario distilling in the second half of the 1800s, straight rye in the American sense disappeared here. Blended whisky became the typical style for Canada in the last 30 years of the 19th century. Still, there is little detailed information as to what specific distilleries, of any size, in the U.S. or here, made. Certain things are known for some of them: aging length, whether charcoal was used to filter, still types over time. But as to how the whiskey was actually made, in reasonable detail I mean from which we might deduce what it tasted like, information is sparse on the ground. Enter S. S. Brumbaugh distillery. I have found a detailed set of notes which describe the rye whiskey made by this pre-Prohibition, central Pennsylvania distillery in the final stages before Prohibition. The first Christian name of S.S. was Simon, active in the late 1800s. His son Oscar ran the distillery until closing under National Prohibition. The notes are contained in the four pages constituting Appendix C in a book of local history entitled Bible, Axe, and Plow, written by Ben F. Van Horn in 1985. Van Horn was a longstanding educator in Bedford County, PA.
Van Horn included the Appendix with permission from a local newspaper which printed a fuller version (it appears) in a special edition in 1971. Since that paper, the Morrison Cove Herald, still exists, I won’t set out Appendix C here, but you can read it in the book, see the first four of the last seven pages – they are not numbered, but scroll to the end and they are easy to find. The notes must have been prepared from a memorandum in the possession of a Brumbaugh descendant. The data is too detailed to have been reconstructed casually from general historical records such as historical news accounts and business directories. For example, the capacity of the aging vats, there were three, is given. Thus, it seems the whiskey was not aged in small barrels, probably because most of it was sold locally in jugs from the distillery. The whiskey was generally given two years age. Some was sold older though, for example, six years old. There is a rough parallel to Canadian Club of the time, sold at approximately seven years of age (it varied) with Walker’s regular rye whisky sold at two and later three years of age. 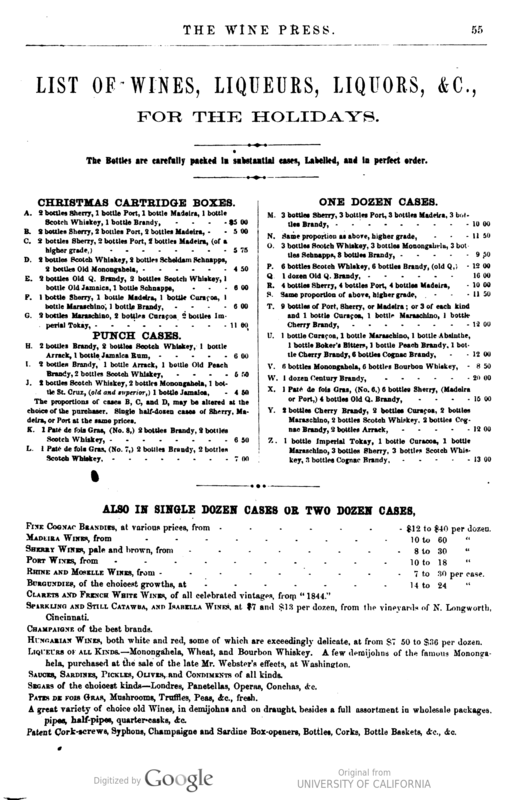 In Hiram Walker’s case, the deluxe “CC” became the flagship, but Brumbaugh’s whiskey was mostly sold at two years old. After all, unlike for CC the market was local and people didn’t tarry over distinctions of age with associated variations of price. The distilling-out proof of Brumbaugh rye was 180, or 90% abv, a very interesting and specific piece of information. This is within the current U.S. definition for whiskey, but higher than is stipulated for bourbon or rye whiskey (maximum 160 proof). So it was a kind of light whiskey and its reputation may have been due in part to this. The vats had to be reused many times, so the wood probably didn’t do much for the whiskey. A less congeneric product would have been greeted favourably by the customers. The still types are explained too, there was a copper still which was probably a pot still, and two wood two-chambered stills. These were clearly a variant of the three-chambered, steam-driven still which a number of Ontario distilleries were using c. 1860. A two-chambered still would have resulted in a more congeneric white dog than the three-chambered still. No charcoal filtering process, a la Tennessee or otherwise, is mentioned for Brumbaugh rye. Bedford County was settled by different ethnicities. A prominent group was the Germans, many of the famed Palatinate immigration of the 1700s. The Brumbaugh name was originally Brumbach. The first ancestor to arrive of Simon Brumbaugh was Johannes Henrich Brumbach. He came to Maryland in 1754 with his wife and children. The family later relocated to central Pennsylvania. Johannes sailed, according to genealogical works I consulted written by Brumbaugh descendants, from “south Germany”. The Brumbaughs were, and no doubt still are, a sizeable group in the U.S. Numerous persons of this surname or related spellings came to America, Johannes was simply one. The descendants spread through the country, and even before WW I some had become doctors, judges, and politicians. The S.S. Brumbaugh distillery never opened after Repeal and the building was razed around 1960. It was solid brick, three stories, with older wooden structures appurtenant. Brumbaugh’s rye likely was a fairly pronounced whisky. It may not have had the full oily character of bourbon or straight rye, but being nine points in proof under the maximum for whisky (189), it had to have whisky-mash character. This was especially so given the generally short aging in reused vats vs. “small wood” such as the typical bourbon barrel. And so, I feel some Ontario old rye was probably very similar to Brumbaugh whiskey. After all, many Germans came to Ontario from Pennsylvania, and of course Loyalists in general. Some were Mennonites and Amish, some were not, some of the Germans were technically Loyalists, some not. But the early Ontario rye whisky has to be related to the kind of rye whisky made in Pennsylvania. While rye whiskey was distilled in other parts of the northeast such as New York and New Jersey, or say in North Carolina, it in turn had to be related to the Pennsylvania type. I wrote earlier that one of the Davis clan of North Carolina who settled in Long Point, Upper Canada made rye whisky on arrival here, and the clan were known to have distilled in North Carolina. “Davis” sounds Scots-Irish or Scottish to me, not German. Even still it is possible all distilling down the Appalachian range was inspired by an original German form (Pennsylvania’s) or at least German input via notably the use of rye. But before we conclude Pennsylvania and maybe U.S. rye in general was German-origin, it should be noted that Simon commenced distilling by buying the distillery in the later 1800s from one Aaron Reed – of his origins I am unaware. He might have been Scots-Irish, or other Anglo-Saxon, or possibly German as the names were often changed. The label shown was included in the book mentioned. Some whisky evidently was bottled but the account referenced makes it clear most was sold locally in bulk to the people. S.S. Brumbaugh was the quintessential, pre-Prohibition country distillery, which had its counterpart throughout early Ontario. 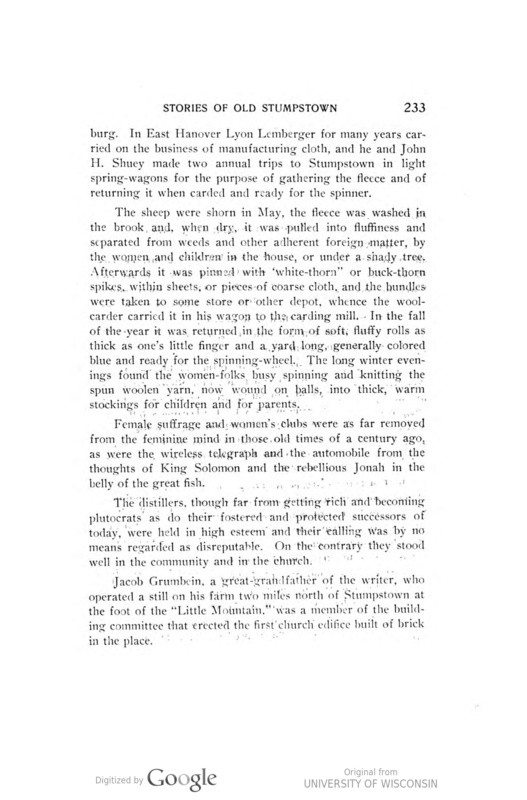 Note re image: the image above is from a label contained in the book linked in the text. All intellectual property therein belongs solely to its lawful owner or authorized users, as applicable. Image is used for educational and historical purposes. All feedback welcomed. Come One, Come All For David Allan’s Pure Rye Whisky! This Canadian whisky advertisement is from 1871, in Guelph, ON. It has a striking elegance which results from both skill in design and economy of expression. Perhaps the native practicality of the Scottish-born distiller and miller, David Allan, led to such pleasing results. 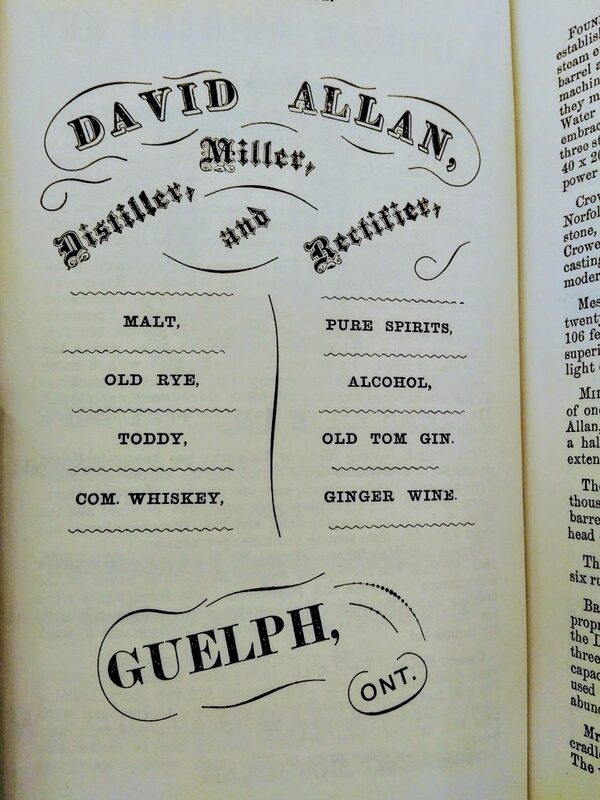 David Allan’s father, William, bought a small mill on the Speed river in Guelph as a rude, wood-frame building, in the 1830s. Father and son were builders and architects with European experience. They expanded the operation to include a distillery, fulling, and furniture business. The Allans were connected to Sir Hugh Allan (shipping, finance, and more) in Montreal who is well-known to anyone versed in Canadian business history. The Allans were among the elite capitalists of their day. The Guelph distillery of David Allan sold thousands of barrels of whisky and other liquors per year, a good example of a distillery that resisted the growth of the Big 5 in Ontario. These were Gooderham & Worts in Toronto, Hiram Walker in Windsor, Seagram in Waterloo, Wiser in Prescott, and Corby in Belleville. David Allan became ill in 1877 and this apparently foretold the end of the operation, but c. 1870 it was doing well. The product line is interesting to parse. The “old rye” was probably pure spirits, perhaps blended with a straight rye (whisky mash) component, aged a year or two in barrels. Malt whisky was a Canadian version of Scottish malt whisky. Not all Canadian distilleries made a malt whisky, and in this case perhaps it was a nod to Allan’s Scottish origins. “Com. whiskey”, that is, common whiskey, was perhaps unaged rye whiskey mash, or maybe alcohol (see below) proofed for drinking strength. Alcohol was probably distilled at 94% abv, sold for industrial purposes, while pure spirit (95% abv or almost) was alcohol further treated with charcoal or re-distillation to remove all residual secondary constituents. The percentages of alcohol in these types may have been lower though, depending on the type of still used by Allan in 1871. Old Tom gin was the pure spirits or alcohol flavoured with juniper, sugar, and citrus or other things to make a sweetened gin. There was no dry gin offered, which perhaps meant the local market hadn’t yet developed the taste for London Dry. Toddy was probably one of the whiskeys sweetened with sugar, ready for hot water to make the now-disappeared 19th century staple, whisky toddy. It is hard to know for certain though on the composition of these without recourse to distillery records. Each distillery probably made something different anyway, especially smaller ones, and the trade terms mentioned had no legal definition at the time. Note: The above image was sourced from the Gazetteer And Directory Of The County Of Wellington for 1871-1872, published by A.O. Loomis & Company in Hamilton, ON. This volume was reprinted by the Wellington County Museum in the 1970s. All intellectual property therein belongs solely to its lawful owner, as applicable. Image used for educational and historical purposes. All feedback welcomed. 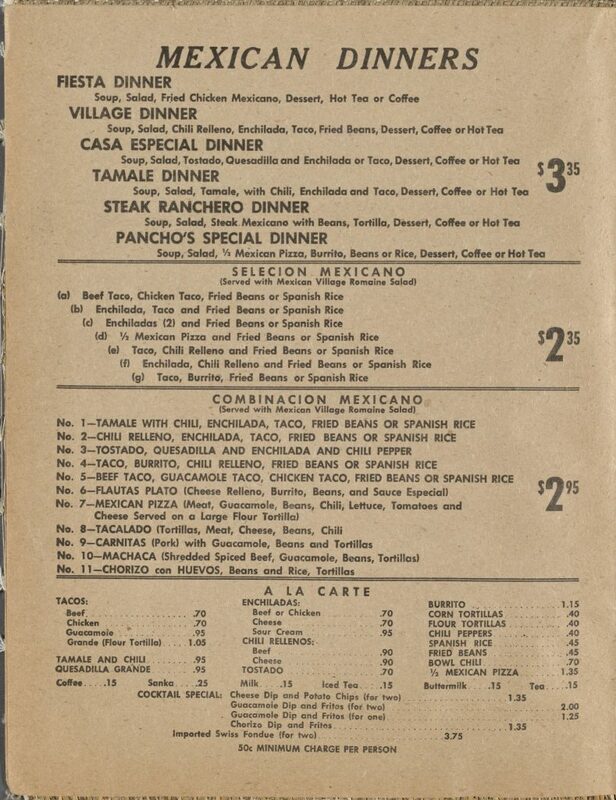 Below is one more menu from 1967 (courtesy the New York Public Library, www.nypl.org) to examine how Mexican cuisine developed in a mainstream U.S. context. 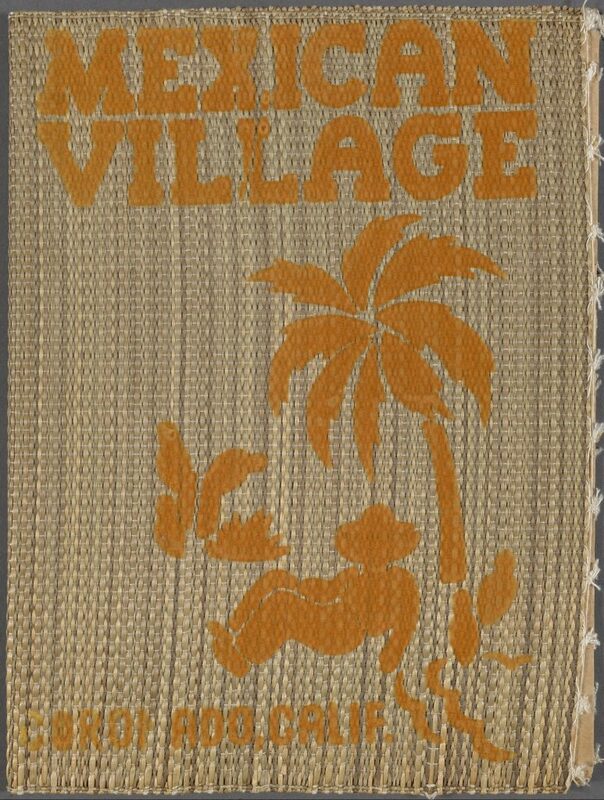 It’s from the “Mexican Village”, which apparently started in 1943 – the year varies according to source, but the 1940s is certain. What became a sizeable restaurant and catering business was initially a small cafe, in Coronado, CA on the peninsula of San Diego Bay. Another Mexican restaurant we discussed, Cafe del Sol, had an approximately 50-year run but Mexican Village did it one better, enjoying almost 60 years in business. This news article, an obituary of an early owner, Bert Forsyth, outlines the history to the mid-1970s. By this time the restaurant had expanded from a simple takeout and bar to one seating many hundreds of guests. There is an interesting Canadian connection as well, connected appropriately to professional hockey via Mr. Forsyth himself. For more detail on the restaurant’s origins see this excellent blog piece by Martin S. Lindsay. He sets out the history of many other early Mexican restaurants in and around San Diego, with some great period images. Even before the 1960s this cooking was available in Latino enclaves in the southwest, often in diners and other informal eateries. There are differences among these categories and within them depending on region or town and sometimes the restaurant. Angelenos are said to like crispy tacos, Texans like the soft kind, etc. The hybridization is shown e.g., by wheat-based tacos (vs. corn), cheddar cheese, use of beef and more meat in general than in Mexico, guacamole and sour cream – these were largely American contributions. Still, the northern belt of Mexico, especially Baja California, always ate something closer to American-Mexican style than the other five or six regions which can differ quite a bit among them. Here, I will focus more on what American restaurateurs offered to diners as “Mexican” in the 1960s. The menu below shows the approach of Mexican Village. It was clearly more adventurous than Cafe del Sol’s as it presented not just a few Mexican dishes, or non-Mexican dishes adjusted to sound Mexican, but a full array of Mexican eating familiar to us today. Rather than describe each dish read them for yourself but before you do, note how American dishes similar to Cafe del Sol’s were also offered: charcoal steaks, lobster, fish dishes, fried chicken, sandwiches; in a word foods familiar to a mainstream audience. It seems Mexican Village always hedged its bets, covering both ends of the spectrum, indeed throughout its existence. Coronado is well south of the L.A. sprawl, not so far from the Mexican border. It had the large U.S. Navy base as a natural constituency. It’s not the same IMO as being in Santa Barbara or L.A. itself and seeking a mainstream audience. I doubt a restaurant with that menu could have succeeded in L.A. in the 1940s, although if I’m wrong I’m happy to see the evidence. At a minimum, Mexican Village was a gateway to a new category of ethnic dining and paved the way for restaurants like Cafe de Sol and indeed another Mexican Village, one that started in 1965 in L.A. The latter’s menu, for the core Mexican items, is not all that different to the Coronado original but it offers many more dishes. Some sound regional Mexican and perhaps even reflect today’s Baja-Cal cuisine. I don’t think an ownership connection existed but the two restaurants are surely linked spiritually. 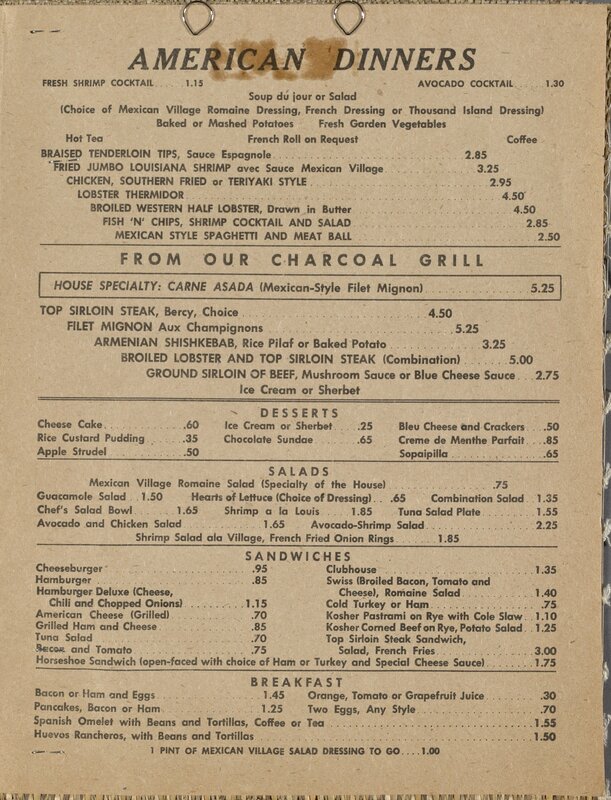 You can read the menu of the L.A. restaurant – it is still going strong, and its own interesting history, here. * I am speaking broadly here, as today distinct Mexican (regional-based) cuisines are available in Los Angeles. The popular Baja-style has arisen from the work of modern chefs in nearby Baja California, Mexico. This is relatively new though, and the hybrid or Americanized form is still generally understood in North America as “Mexican”.